Do you play a sport? Does your family have a reunion coming up? 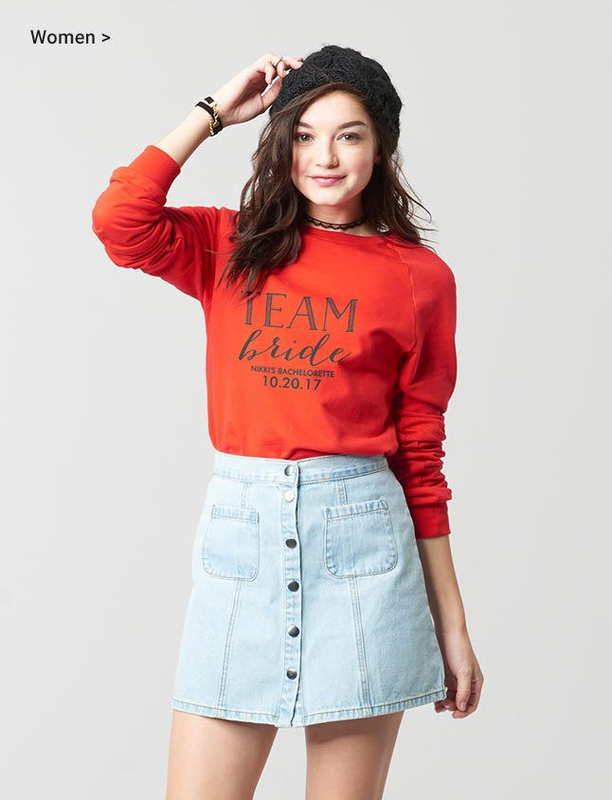 Are you in a club with a t-shirt budget? If you answered yes to any of these questions, you've come to the right place! You can tank me later. 1. Zazzle lets you customize seemingly anything! But I know you're here for the shirts, and they've got you covered. 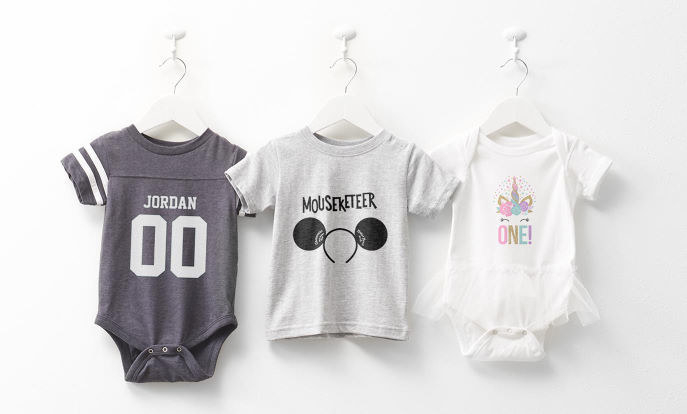 Pick from hundreds of customizable options for men, women, kids, and even babies! Why it's great: No minimum quantity, order 1 or order 100! You can also add personal edits to already existing designs if creating your own from scratch is too much pressure! Use code "ZFLASHDEALS2" for 15% off your entire order! Prices: $9.45+ for the tee, customization extra depending on the design. How long it takes: Standard orders in 8–10 days, premium orders in 7–8 days and express orders in 3–6 days. Get the baby designs pictured above here, here, and here. 2. Allied Shirts is looking out for your budget! If you're part of a local sports team, graduating class, or about to jet, set, on a family retreat, check out these tee-riffic prices! Why it's great: They have budget options, if you find a better price online, they'll match it! They also have great templates to choose from so you don't have to come up with your own from scratch. Finally, they offer free shipping on all full-price orders! Prices: $2.31+, for the tee, customization extra depending on the design. How long it takes: Guaranteed delivery within 10 business days. Orders can be rushed and get to you in 5 days for a small fee. Get the design pictured above here. 3. 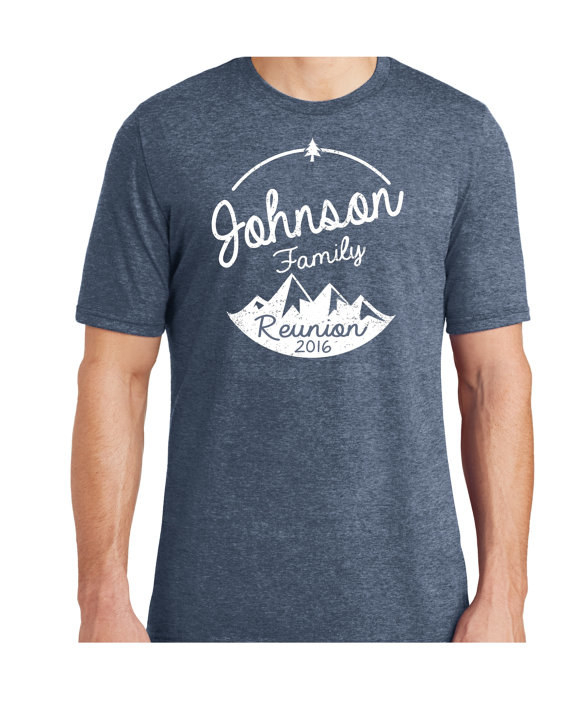 Cafe Press provides an easy-to-use design tool and customizable pre-designed templates, so it doesn't take years off your life making a t-shirt for your next family reunion! Uncle Carl isn't gonna appreciate your hard work anyway! Why it's great: Two words: Custom. Onesies. Also, if you need assistance during any step of the process, one-on-one help is available Monday through Friday from 6am to 9pm EST — for free! Prices: $17.99+ for the tee, customization extra depending on the design. Also check out their bulk pricing chart for sweet savings! How long it takes: Economy orders in 9–13 days, standard orders in 8–9 days, premium orders in 6–7 days, and express orders in 3 days. 4. Blu Yeti's owners have been printing t-shirts for over 12 years! 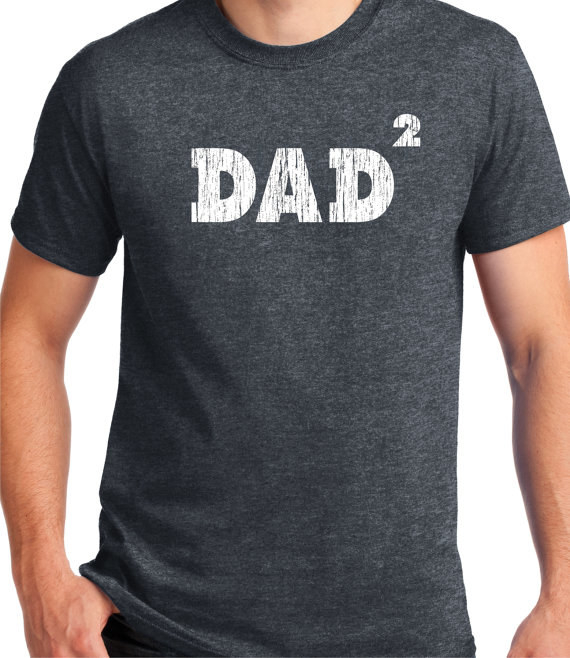 They have some pretty rad shirts you should check out for Mother's day, Father's day, or just a random Tuesday! Why it's great: The designs are already made so you just have to add a custom name, date, or age and you're set to go! Prices: $7.49+ for the tee, an additional $2 for all custom upgrades. How long it takes: Depending on the custom design, it can take up to a week to complete the order. Once completed, shipping takes 1-2 business days! Get the design pictured above here and here. 5. Custom Ink offers the brands you love to wear with the designs you love to see. Plus they have an inkcredible amount of options to choose from! Why it's great: You get to wear familiar brands you love like Under Armour, Nike, American Apparel, The North Face, Gap, Adidas, and more! They also have this awesome fundraising feature where you can put your shirt/design up for sale and raise money for a cause close to your heart. Check out more information here. Prices: $19.64, plus customization extra depending on the design. How long it takes: Free shipping in 14 days, rush shipping in 7 days, and super rush in 3 days. Get the brands pictured above here. 6. Design Crowd is a great option for a larger event, company, or long-term project! They have a community of designers who work off of your design brief and then pitch you options. After picking the winning designer, you can make edits with them in real time! WOW! Why it's great: You can look at each designer's portfolio to see if their past work goes with the aesthetic you have in mind. They have other 625,000+ designers to choose from! Prices: Set your own budget starting from $99+. How long it takes: For the design process, you can choose your own time-frame from 2, 5, 10 and 15 days. Once the design is set, it will take 9–11 business days for Standard Shipping. 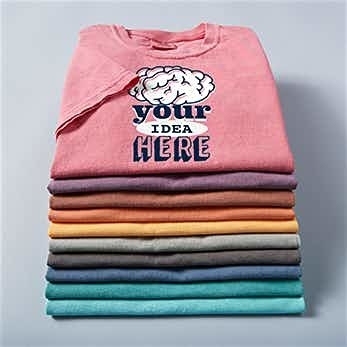 Get the started on your professional t-shirt design here. 7. Rush Order Tee works for any procrastinators looking for a quick fix. You'll get qualitee designs you want in the time-frame you need. Promising review: "I can't believe how much I love these t-shirts and I'm amazed at how quickly they were done. Four couples are cruising the Caribbean tomorrow and our custom shirts will be a major hit. Thank you all!" —S.K. Why it's great: Right now you can get 30% off custom printed apparel with free 8-day delivery! Prices: Get a free quote for your design here. How long it takes: Free shipping guaranteed within 12 days; rush delivery in 4 days. Get the designs pictured above here. 8. Crazy Dog T-Shirts will have your entire crew scoring big discounts on bulk orders! Lots of shirts at a really good price, that's the goal isn't it? Why it's great: Free shipping, and no minimum order! Prices: $4.50+ for the tee, customization extra depending on the design. How long it takes: 5–7 business days. Get your own version of the designs pictured above here! You, after ordering one of every custom design.